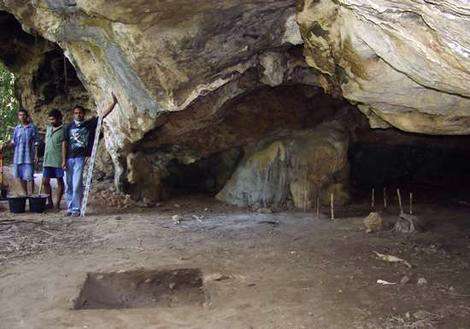 Jerimalai Cave in East Timor is the oldest evidence of occupation by modern humans on the islands that were the stepping stones from South-East Asia to Australia. People lived there more than 42 000 years ago, eating turtles, tuna and giant rats. An Australian archaeologist has discovered the oldest evidence of occupation by modern humans on the islands that were the stepping stones from South-East Asia to Australia. A cave site in East Timor where people lived more than 42 000 years ago, eating turtles, tuna and giant rats, was unearthed by Sue O'Connor, head of archaeology and natural history at the Australian National University. Dr O'Connor also found ancient stone tools and shells used for decoration in the limestone shelter, known as Jerimalai, on the eastern tip of the island. She said her discovery could help solve the mystery of the route ancient seafarers took to get here from South-East Asia. It strengthens the view that they made a southern passage, via Timor, rather than travelling northwards via Borneo and Sulawesi, then down through Papua New Guinea. "The antiquity of the Jerimalai shelter makes this site significant at a world level," said Dr O'Connor, who presented the findings at the annual conference of the Australian Archaeological Association this month. Sea levels were lower when modern humans set off around the coast from Africa more than 70 000 years ago. People who made it to the large South-East Asian land mass known as Sunda, however, still had to cross deep ocean channels to get to Australia, then joined to Papua New Guinea in a continent called Sahul. Until now, the age of habitation sites found on the stepping stone islands in between had been much younger than those found in Australia, making it impossible to determine the route taken. Although the Jerimalai site is at least 42 000 years old, it could be much older, Dr O'Connor said, because this was the detection limit of the radiocarbon dating method used. She said the simple stone tools unearthed in the shelter were similar to those used by the species of hobbit-sized people who lived in a cave on the nearby island of Flores until 12Jerimalai000 years ago. But she was confident Jerimalai's inhabitants were modern humans, Homo sapiens, and not small-brained members of Homo floresiensis, because of the evidence for their sophisticated behaviour found in the dig. Fish such as tuna, for example, "could only have been captured in the deeper waters offshore using hooks, and probably also water craft", she said. The find, however, raised big questions, such as why modern humans appeared to have bypassed Flores on their way to Timor. One possibility was that the hobbits were able to repel them. "It is clear that this region warrants a great deal more study," Dr O'Connor said. Jerimalai shelter is in East Timor, where Dr Sue O'Connor of ANU has discovered the oldest evidence of occupation by modern humans on the islands that were the stepping stones to Australia. Jerimalai Cave in East Timor, and possible migration routes for the initial colonisation of Australia more than 40 000 years ago. The oldest evidence of occupation by modem humans on the islands that were the stepping stones to Australia has been discovered by an Australian archaeologist. A cave site in East Timor where people lived more than 42 000 years ago - dining on turtles, tuna and giant rats - was unearthed by Sue O'Connor, head of archaeology and natural history at the Australian National University.v She also found ancient stone tools and shells used for decoration in the limestone shelter, known as Jerimalai on the eastern tip of the island. Associate Professor O'Connor said her discovery could help solve the mystery of the route ancient seafarers took to get here from South-East Asia. It strengthened the view that they made a southern passage, via Timor, rather than north via Bomeo, Sulawesi and down through Papua New Guinea. "The antiquity of the Jerimalai shelter makes this site s at a world level," said Dr O'Connor, who presented the findings at this month's annual conference of the Australian Archaeological Association. Sea levels were lower when modem humans set off around the coast from Africa more than 70 000 years ago. People who made it to the large South-East Asian land mass known as Sunda, however, still had to cross deep ocean channels to get to Australia, which was then joined to Papua New Guinea in a continent called Sahul. Although the Jerimalai site is at least 42 000 years old, it could be much older, Dr O'Connor said, because this was the detection limit of the radiocarbon datin method used. She said the simple stone tools unearthed in the shelter were similar to those used by the species of hobbit-sized people that lived in caves on the nearby island of Flores until 12 000 years ago. But she was confident Jerimalai's inhabitants were modern humans, Homo sapiens, and not small-brained members of Homo floresiensis, because of the evidence for their sophisticated behaviour found in the dig. Fish such as tuna could only have been captured in deeper waters offihore using hooks, and probably also water craft she said. 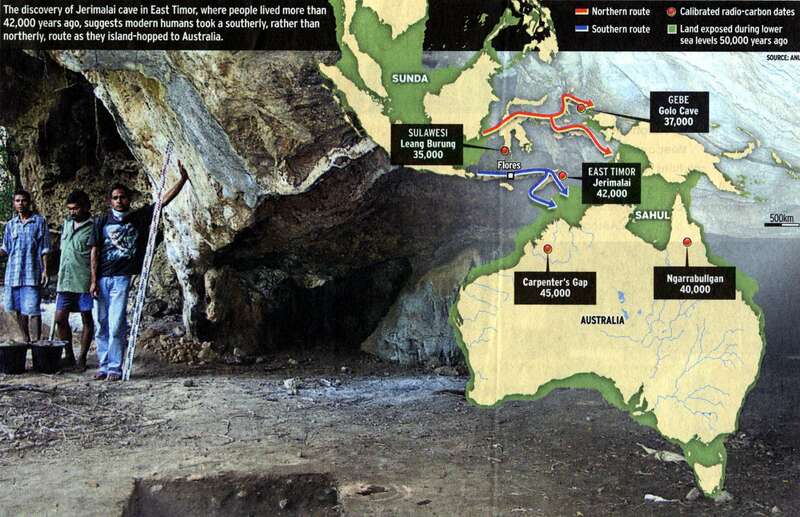 The find raised big questions, such as why modem humans appeared to have bypassed Flores on their way to Timor. One possibility was that the hobbits were able to repel them. Newer dating techniques have revealed people first arrived in Australia between 50 000 and 60 000 years ago. Dr O'Connor said these dating techniques needed to be applied to sites in South-East Asia. The Jerimalai area is unusual in having been geologically uplifted, preserving a window into the past. The oldest evidence of occupation by modern humans on the islands that were the stepping stones to Australia has been discovered by an Australian archaeologist. A cave site in East Timor where people lived more than 42 000 years ago - dining on turtles, tuna and giant rats - was unearthed by Sue O'Connor, head of archaeology and natural history at the Australian National University. She also found ancient stone tools and shells used for decoration in the limestone shelter, known as Jerimalai, on the eastern tip of the island. It strengthened the view that they made a southern passage, via Timor, rather than north via Borneo, Sulawesi and down through New Guinea. "The antiquity of the Jerimalai shelter makes this site significant at a world level," said Dr O'Connor, who presented the findings at this month's annual conference of the Australian Archaeological Association. Sea levels were lower when modern humans set off around the coast from Africa more than 70 000 years ago. People who made it to the large South-East Asian land mass known as Sunda, however, still had to cross deep ocean channels to get to Australia, which was then joined to New Guinea in a continent called Sahul. Although the Jerimalai site is at least 42 000 years old, it could be much older, Dr O'Connor said, because this was the detection limit of the radiocarbon dating method used. Fish such as tuna could only have been captured in deeper waters offshore using hooks, and probably also water craft, she said. The find raised big questions, such as why modern humans appeared to have bypassed Flores on their way to Timor. One possibility was that the hobbits were able to repel them. Newer dating techniques have revealed people first arrived in Australia between 50,000 and 60 000 years ago. Dr O'Connor said these dating techniques needed to be applied to sites in South-East Asia. The Jerimalai area is unusual in having been geologically lifted, preserving a window into the past. This paper reports new finds from Timor, where a habitation site dated to 38,255+/-596 b.p. or > 42,000 calBP provides the earliest evidence for migration by modern sapiens east of the Sunda Shelf into Island Southeast Asia. Until now there has been a major discrepancy between the dates for earliest occupation in Australia and those from island Southeast Asia, with the earliest dated sites from Australia being significantly older than the oldest sites from any of the potential stepping stone islands en route (even relying purely on the radiocarbon chronology). Although a southern route through the Lesser Sunda islands (including Flores and Timor) has usually been proposed as the most parsimonious for maritime passage to Sahul (the ancient continent that encompassed Australia and New Guinea), the lack of early dated evidence on any of the stepping stone islands of this group has led some authors to propose alternative routes (albeit equally lacking in evidence for early colonization). Perhaps the greatest recent challenge to the southern route has been posed by the recent finds from Flores, Timor's eastern neighbour island, where modern humans apparently failed to colonise prior to the Holocene. The new dates and data from Timor redresses this situation, and indicate that the southern route is still the strongest contender for the earliest seafaring passage to Sahul. With moderns humans firmly ensconced in Australia by this time, it would not previously have been considered necessary to argue the case that a site of this age was the product of modern human behaviour; especially for a site on an island requiring a water crossing to reach it. But the fact that a non-modern hominid was present on Flores until 12 000 years ago changes this. In the absence of human skeletal remains, the nature of the occupation evidence from Timor is evaluated in order to demonstrate that it is qualitatively different from the assemblage produced by non-moderns from the late Pleistocene context at Liang Bua, as well as for its significance in contributing to our understanding of the types of adaptations made at this early date on route to Sahul.